Supplemental lessons to make you better. THESE LESSONS cover a wide variety of topics which all will help you become a more powerful, efficient, and independent guitarist. Take a look through them and learn about subjects that intrigue you or that you might find useful, as each lesson will reveal another facet of guitar playing and deepen your understanding. 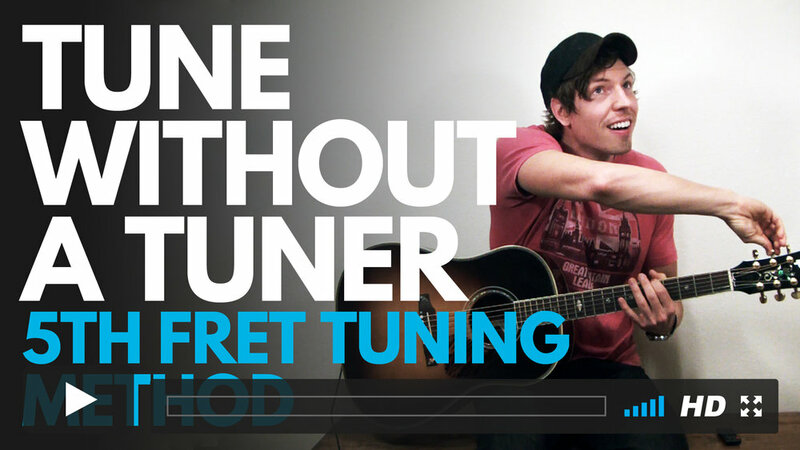 Learn how to tune using a standard clip on tuner to get your guitar soundin' good! Learn the 5th Fret Tuning Method (which is a little bit of a misnomer because it also uses the 4th fret) so that you can tune without a tuner! Comes in very handy. Bust out that new, shiny pair of strings and learn alongside Jairus as he teaches you how to change the strings for an acoustic guitar. NOTE: This lesson applies to steel string acoustic guitars only. This is not meant for electric or classical guitar. Needing a guitar? Don't buy the wrong one! Let this 13 minute crash course save you from years of regret and teach you exactly what you need to be looking for when buying a guitar. You'll learn to shop like a pro and find a guitar you absolutely love that you can keep for a lifetime! Ever wonder why some chords have all those little letters and numbers in their name--like Am7, Cmaj7, Dadd4, or Fsus2? Those letters and symbols are very important and knowing how they work can give guitar players a lot of power over their playing and ability to read chord charts. This lesson will reveal how chords are made. NOTE: I would recommend having gotten far enough in the 20 lesson program to have learned the major scale and the numbers associated with it, otherwise this lesson may seem over your head. Want to know how to easily play all the "non-standard" keys like Ab, Bb, Db, Eb, etc? Well, this is the lesson for you! By using only a capo and a slight variation on standard tuning you can easily play in any key you encounter. This is a super powerful way of tuning, one that I use more often than standard tuning. PREREQUISITES: This lesson assumes you know 3 things: 1) your flat and sharp alphabets, 2) How to put a capo on your guitar, 3) chord shapes in the keys of C, A G, E, and D. There are also references to both Number System and CAGED Method, so it would be great for you to know about those as well, but it's not required. Want to make your guitar-playing life easier? Then learn more than one way to play the major scale. Doing so will greatly decrease the amount of time it takes for you to find the "seven chords of the key." In this lesson you will also learn about octaves, intervals, and how to read scale charts. Lots of people who learn guitar also want to be able to sing along with their playing, but this can present some rhythmic challenges! This lesson will help your brain create "rhythmic separation"--being able to control 3 parts of your body, each with independent rhythm--by having you practice the same movements a drummer makes. This one's fun, y'all! -Songwriting Starters: melodies, rhythms, poems, and pain. Sign up and get access to every single lesson and chord chart! Click here to return to the "Discover Lessons" page to check out more lessons!